Does my home insurance cover storm & weather damage? Insure 24-7 > Articles > Has Storm Doris Damaged Your Home? Will Your Home Insurance Cover The Damage? Yesterday the UK was bruised and battered by storm Doris. The storm brought heavy rain, snow and winds of up to 94mph causing flight, road and rail disruptions. Doris caused mass devastation; trees uprooted, homes damaged and sadly claimed a life. During today’s clean up operation you may be wondering whether your home insurance policy will cover the damage caused by a storm? If you have content and building insurance then you will be covered, if you only have contents insurance you will have to pay for the bills yourself; it is the buildings part of your insurance which covers damage to a property. Insurers understand how chaotic the weather can be in the winter and know that accidents can happen in severe weather. Insurers want to help you recover the damage asap. Insurers tend to use the Beaufort scale when accessing whether damage has occurred to a property due to the weather. The scale categorises wind speeds on a scale of 0-12 and winds that reach above a certain point on the scale are classified as ‘storm force’ which can cause damage to a property. 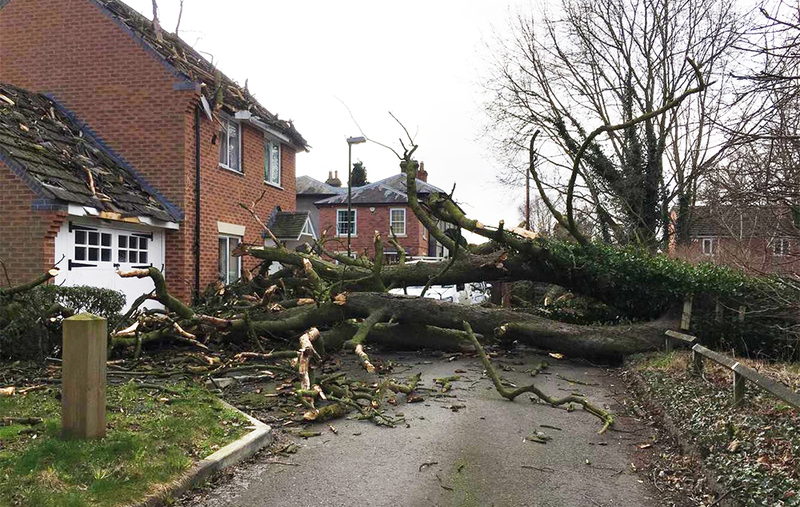 If your house has been damaged by storm Doris, then contact your insurer as soon as possible. They will give advice on how to get repairs fixed as soon as possible. Make sure you take photographs of the damage and note down the time it took place if possible, allowing your insurer to tally up with the weather report. If you have photographs of your property before, submit those to your insurer too. Arrange temporary emergency repairs to prevent further damage. Inform your insurer and keep hold of the receipts to build your case. Don’t throw away any damaged items, they could be repairable. Let your insurer know and they can advise you. Insure 24-7 offer protection against storm & weather damage in our home & contents insurance policies. Contact us today to protect your home from Britain’s wild winter weather. We can provide maximum cover at minimal costs.